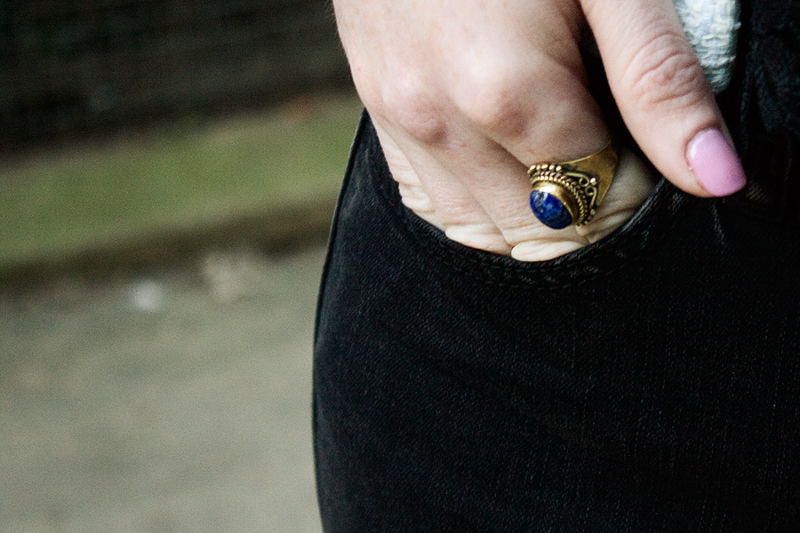 You know when you find that perfect pair of jeans? Well I found them on Saturday, in American Eagle Outfitters (AEO) in Westfield Shopping Centre. I laid eyes on them on the shop mannequin raced over to the sales assistant to ask him were the dark wash ones available in-store yet. This particular style of cropped jeggings with frayed ends were new in stock as part of the SS15 collection. A few weeks ago I went to a bloggers tea-party where we did a photoshoot wearing AEO clothing and we were each gifted with an AEO voucher. 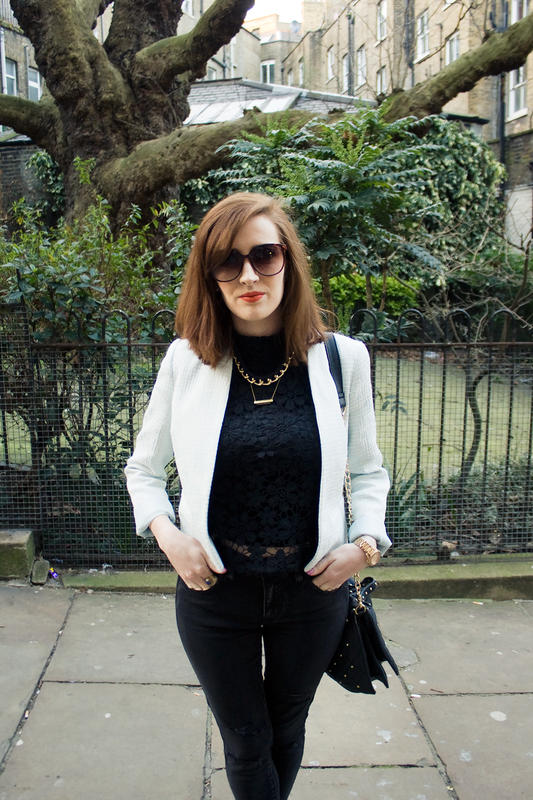 I used my voucher to treat myself to these jeans – the perfect Bec Boop jeans! I say this because they are cropped leg jeggings and I do love to turn up the end of my jeans. This proves troublesome when you have super short legs! 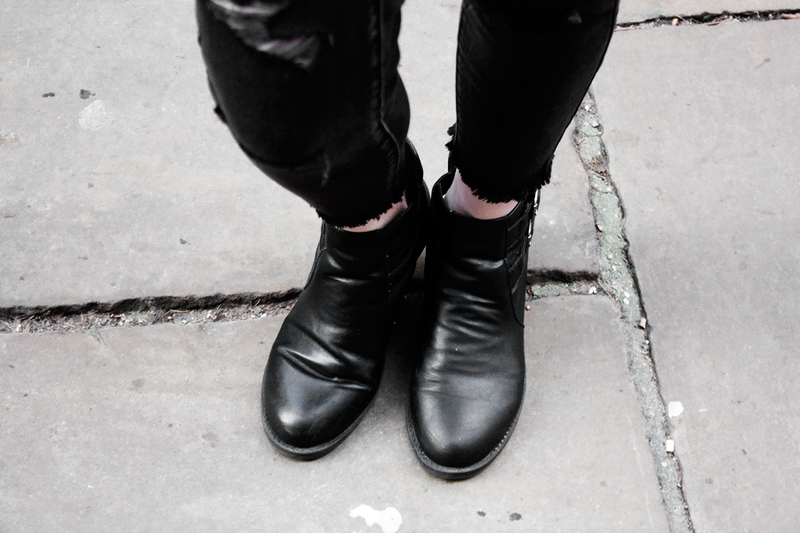 Not with these jeggings though, they are perfect. Shorter leg jeans or turned up jeans can give the illusion of longer legs. The ends are frayed also which look quite edgy combined with the rips on the legs. I loved the look of these cropped jeans with the ankle boots and I can only imagine how awesome they would look on you lucky ladies blessed with long legs! I also love the wash which is a black denim faded wash. AEO jeans have an amazing fit. They just hug your legs completely and I even ended up sizing down as they were quite stretchy. AEO use US sizing so make sure you know the conversion here. 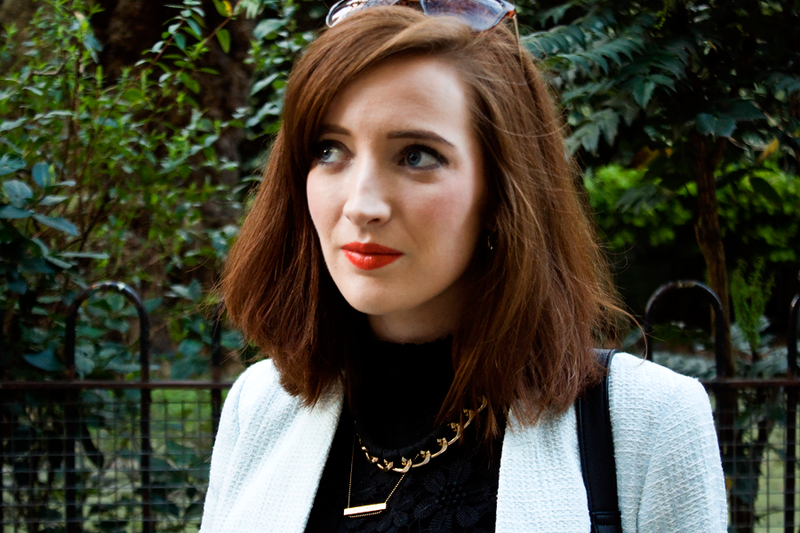 I wanted to keep the outfit all-black and add a pastel pop with this cropped blazer from New Look which you might have spotted in my February Haul video. 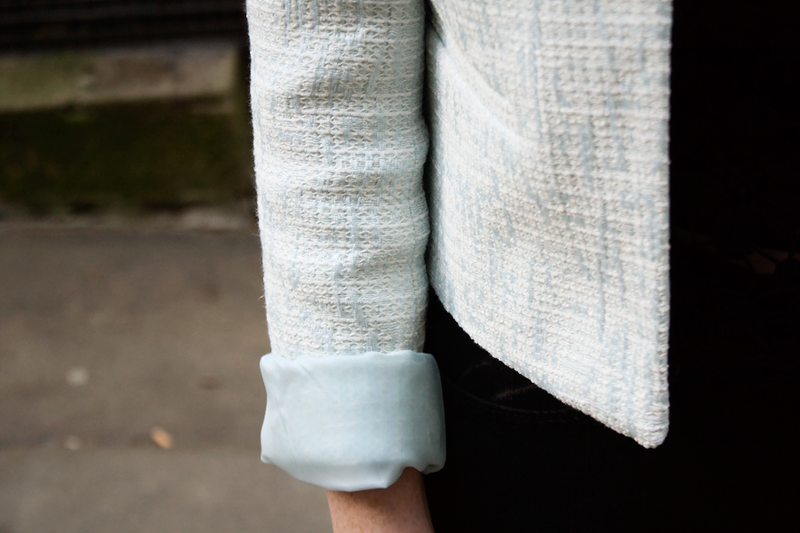 I think it’s the perfect dressy cropped blazer for Spring and pale blue is such a pretty colour for this time of year. 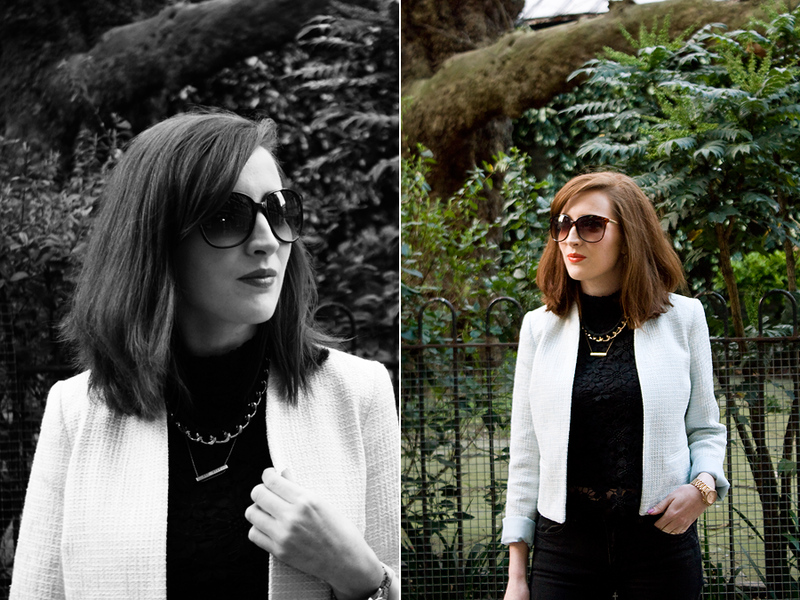 The jacket would also work really well with office-fashion so I think it can be varied quite a bit. I wanted to keep the accessories black and gold so layered two necklaces. The first is a black and gold rope necklace from Closet Treasure, it’s a simple statement necklace and hangs at a really nice length. 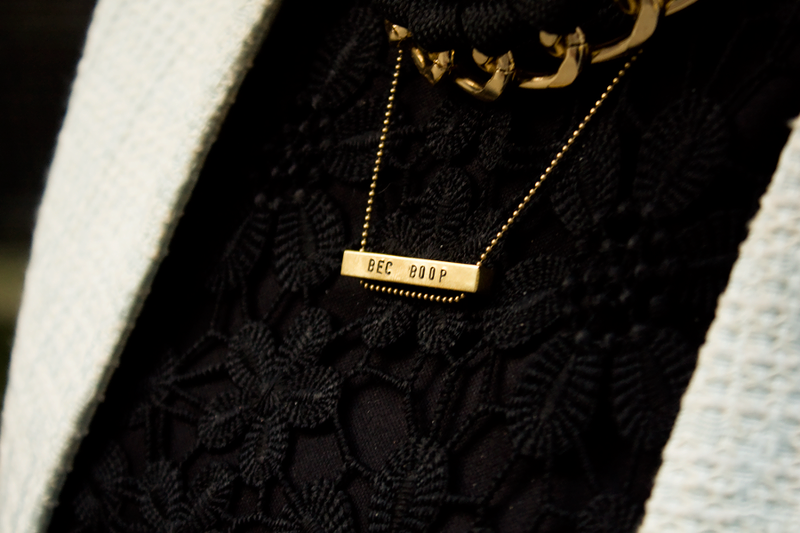 Then I added my everyday ‘Bec Boop’ necklace which I pretty much wear on a consistent basis. I love the shot Lix got off this necklace! I enjoyed dressing up my ripped jeans and I think the simplest way to do this is by adding a blazer and some statement jewellery. 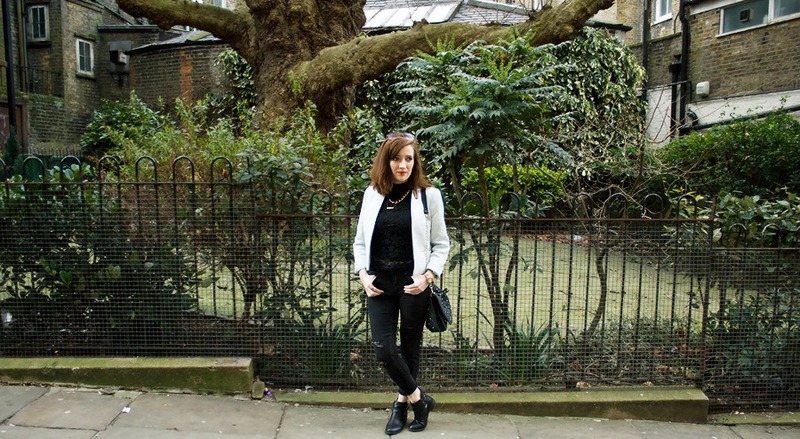 It is possible to pull off a sleek look in ripped jeans! I’d love to hear from you in the comments below. How would you wear your ripped jeans for a classy look? Oh wow… such a sophisticated look. I love the makeup and the elegant vibe in the outfit. The customized pendant is so unique as well! Thanks Siobhan 🙂 I wear it every day lol!